As of June 30, 2015 I retired from my full time job. That career gave me the ability to start two businesses- BLS designs ( my hand tailored purses and totes) and Limestone Threads. In the past I have sold my purses and totes at craft shows in Central New York. As fun as that was, my focus was to have a fabric store with quality quilters cottons, notions and patterns. That is Limestone Threads! You can find me here-online, and at Quilt Shows and Retreats. As you might guess from the fabrics you find here, I love bright, colorful fabric, which is so different from the colors I wear! Hopefully, you will find fabric you love here. I offer quilting fabric, purse hardware, purse patterns and patterns for typical quilting projects. Please enjoy your self while looking through Limestone Threads. April 6-7 : The Delmar Q.U.I.L.T. Inc Guild of Delmar, NY The Show is at the Hilton Garden Inn in Troy. April 27-28: Common Threads Quilter's Guild Show at Broome West Senior Center, Endicott, NY. May 4-5: Wings Falls 2019 Quilt Show at the Queensbury Hotel, Glens Falls, NY. May 9-11: Quiltfest at Lancaster Resort& Conference Center, Lancaster, PA.
May 31- June 2: Genesee Valley QuiltFest at RIT, Gordon Field House, Rochester, NY. June 8-9: Eastern Long Island Quilter's Guild, Inc., Suffolk Community College Eastern Campus, Riverhead, NY. June 26-29: 43rd Annual Vermont Quilt Festival, Essex Junction, VT.
July12-13: Towpath Quilt Guild Show at Canastota High School, Canastota, NY. August 15-17: World Quilt New England at mass mutual Center, Springfield, MA. Sept. 14-15: The Bennington Quiltfest (The Quiet Valley Quliters) at Mount Anthony Middle School in Bennington, VT.
Sept. 19-21: Quilting on the Bayfront at the Bayfront Convention Center in Erie, Pa.
Sept. 27-28: Southtowns Piecemaker's Quilting Guild Show at Annunciation Church in Elma, NY. Oct. 4-5: Thumbstall Quilt Guild Show at St. George's Macedonian Church in Syracuse, NY. Oct. 11-12: Keystone Quilter's 2019 Quilt Show at Finland Mennonite Church in Pennsburg, PA. I started out searching for shows and all of a sudden I have 15!!! That being said- I am starting on 2020 so if you have a show coming up in 2020 please let me know so I can pencil it in the calendar! 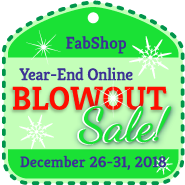 Thank you for shopping with me in the past and I hope to see you this year! Slow but sure.....More to come!